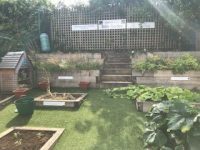 On Wednesday 5th September the signs were fitted in our Bible Garden. In our special garden each class has a growing area where they can grow different flowers, fruit and vegetables which are mentioned in the bible e.g. peas, winter lettuce, garlic and onions. On each of the classes growing areas what is being grown at particular times of the year is listed along with the bible quote. This entry was posted on Wednesday, September 5th, 2018 at 1:56 pm	and is filed under Catholic Life, Celebrating Faith, Gardening. You can follow any responses to this entry through the RSS 2.0 feed. You can leave a response, or trackback from your own site.